As we use our phone so much, that its battery become low in very few time. So what happen if you get a phone with that you can charge your another phone. 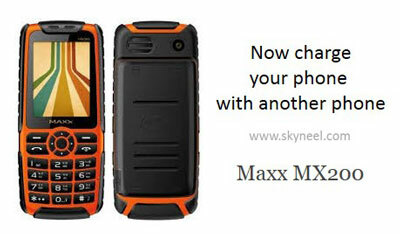 Maxx mobile company launched its new phone MX200. The Maxx MX200 comes with battery 5200mAh. Now you can charge your another phone with this phone. The price of this phone is Rs.1, 848. The main highlight of this feature phone is its battery of 5200mAh. This phone can be used as a power bank phone to charge another phone. Chairman and Managing Director of Maxx Mobile Mr. Ajay Agarwal, said that their Company develop phone according to their customer need. The consumers of semi-urban and in rural areas people need phones which have good battery life and can be sustain in rough conditions. For their need we produces MX 100 last year, in which we gave a 4400mAh power long lasting battery tha can also used as a power bank to charge other mobiles. As we got very good response of MX 100, we came with our new phone MX 200 which has similar specification. But Its screen size bigger then MX 100. This phone has 2.4 inches screen. This phone supports many languages like English, Hindi and Gujarati. Upto 8GB micro SD card can be used in this phone. It has audio –video player, FM, Bluetooth, GPRS features also. In last December Maxx already launched power house category phone MX100, with this phone also you can charge another phone. In MX100 4400mAh battery used. With this feature phone you can charge your devices like Smartphone, Tablet. The price of this phone is Rs. 1, 589. These phone specially made as per the needs of villagers, where electricity is big problem.